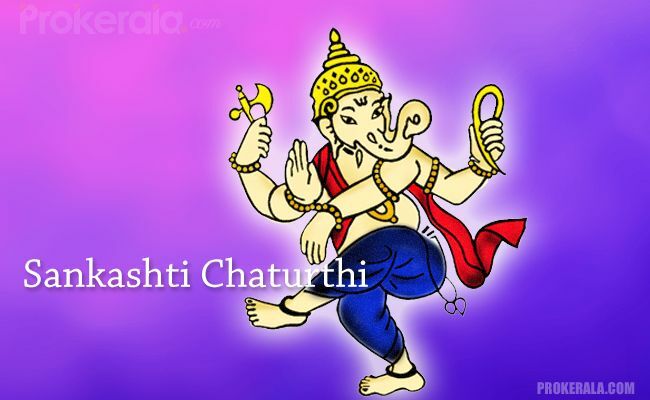 Sankashti Chaturthi is an auspicious festival for Hindus, celebrated in honour of Lord Ganesha. It is observed every Hindu calendar month on the ‘chaturthi’ (fourth day) of the Krishna Paksha (the waning phase of moon). The observance of this Chaturthi in the Indian state of Tamil Nadu is known by the name of ‘Sankat Hara Chaturthi’. Furthermore when Sankashti Chaturthi falls on a Tuesday, it is popularly referred as ‘Angaraki Chaturthi’ that is considered to be the most auspicious of all the Sankashti Chaturthi days. The celebrations of Sankashti Chaturthi are prevalent in both northern and southern states of India. In the state of Maharashtra, the festivities are even more elaborate and grandeur. The word ‘sankashti’ has a Sanskrit origin and it implies ‘deliverance during difficult times’ whereas ‘chaturthi’ means ‘fourth day or the day of Lord Ganesha’. Therefore on this propitious day devotees worship Lord Ganesha to help the overcome all the obstacles in life and come out victorious in every tough situation. On the day of Sankashti Chaturthi, devotees get up early and dedicate the day worshipping Lord Ganesha. They observe a strict fast in the honour of their deity. Some people can also keep a partial fast. The observer of this fast can only devour fruits, vegetables and roots of plants. The staple Indian diet on this day comprises of peanuts, potatoes and sabudana khichadi. The Sankashti puja is done in the evening, after seeing the moon. The idol of Lord Ganesha is decorated with Durva grass and fresh flowers. A lamp is also lit during this time. Other usual puja rituals like lighting incense and reciting the Vedic mantras are also performed. After this the devotees read the ‘vrat katha’ specific to the month. The fast is broken only after worshipping Lord Ganesha in the evening and sighting of the moon. Special ‘naivedya’ comprising of modaks and other favourite eatables of Lord Ganesha is prepared as offering. This is followed by an ‘aarti’ and later the prasad is distributed among all the devotees. On the day of Sankashti Chaturthi, special puja rituals are also dedicated to Moon or Chandra God. This involves sprinkling water, chandan (sandalwood) paste, consecrated rice and flowers in the direction of moon. On this day it is auspicious to recite the ‘Ganesha Ashtothra’, ‘Sankashtnashana sthothra’ and ‘Vakrathunda Mahakaya’ to name a few. In fact any other Vedic mantras dedicated to Lord Ganesha can be chanted. The story of each of this vrat is unique for every month and is recited in that month alone. As per the Hindu scriptures, on this holy day Lord Shiva declared the supremacy of His son, Sankashti(another name for Lord Ganesha) over other Gods, except Vishnu, Lakshmi and Parvati. From then onwards, Lord Sankashti is worshipped as the God of prosperity, good fortune and freedom. It is believed that on the day of Sankashti Chaturthi, Lord Ganesha, for all His devotees, bestows His presence of Earth. The significance of Sankashti Chaturthi vrat is mentioned in the ‘Bhavishaya Purana’ and ‘Narasimha Purana’ and was also explained by Lord Krishna himself, to Yudhishtira, who is the eldest of all Pandavas.